Trance is, at times, quite entrancing; that is, until everything is laid out on the table and explained clearly. Puzzles become much less interesting when you’re not only given all of the pieces, but also have them neatly put together for you. Director Danny Boyle’s familiar frenetic style is on display from the opening moments of the film when fine art auctioneer Simon (James McAvoy) takes the audience through the workings of his London auction house and procedures to be followed during robbery attempts. Of course, then, there will be a robbery. 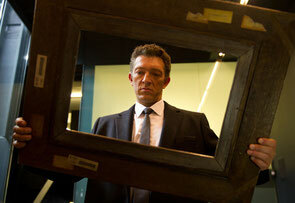 In his attempt to save a painting that had just sold for $27 million - Francisco Goya's “Witches in the Air” – Simon is knocked unconscious by heist mastermind Franck (Vincent Cassel). The robbers get away clean only to realize the painting has been cut from the frame and they have nothing; while Simon awakes in the hospital without a clear memory of the incident. Plan B involves putting Simon in a hypnotic state to recover the memory. In one of several scenes involving an iPad, Simon chooses hypnotherapist Elizabeth Lamb (Rosario Dawson) because he “likes her name.” Elizabeth is no sap and quickly unravels the gang’s plan – but why is she so emotional about it? She confronts Franck and wants a piece of the cut for retrieving the memory, which is agreed upon. An intriguing setup no doubt and one that you would think with Boyle at the helm would be an energetic, robust experience. Problem is Trance spends a majority of its second and third acts just spinning its wheels without a lot of forward momentum as we wait (and wait) to get to the “Big Reveal” we know is coming. Not that we know what’s going to happen exactly, just that something will. Much of the time is spent listening to the soothing voice of Elizabeth as she delves into the mind of Simon. Rosario Dawson is effective in the role and it’s a testament to her that I didn’t get completely annoyed and tired at listening to her speak for such long stretches. We get some of Boyle’s signature pops of color, interesting angles and bursts of sound, but because of the bland content of the hypnotism sessions it becomes a case of a lot of style without a lot of substance. At points the film tries to trick us into thinking we saw something we didn’t through playing with timelines and locations, but it doesn’t effectively throw us off track. When it finally comes time to wrap everything up and reveal all of its secrets, Trance relies on a ‘Great Explainer’ to outline everything for the audience. While this method can be effective in some cases (an unreliable character, etc. ), here it just comes off as lazy, especially after all the work it took to get up to this point. The timing of this character revealing everything is questionable as well – if they had just waited a bit longer they could’ve ensured they were in control of the situation without having to go through a harrowing grand finale. In what is supposed to be a profound final scene, one character is presented with what is supposed to be a meaningful choice. Problem is, like much of what came before, none of it really matters.